According to the latest statistics on the issue, there were 425 Israeli occupation settlements and military bases in the West Bank (including 150 settlements and 107 outposts) by the end of 2016. Data indicated that the total number of settlers in the West Bank was 636,452 by the end of 2016, 302,188 (47.5%), of them lived in Al-Quds Governorate, including 222,325 of them lived in Jerusalem J1 (those parts of Al-Quds which were annexed by Israeli Occupation in 1967). In demographic terms, the proportion of settlers to the Palestinian population in the West Bank is around 21.8 settlers per 100 Palestinians compared with 68.3 settlers per 100 Palestinians in Al-Quds Governorate. 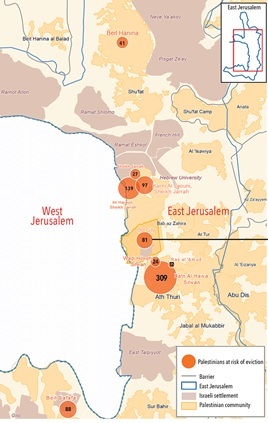 In addition, the data indicated that the expansion and annexation wall detaches more than 12% of the West Bank, and these imposed restrictions on 1.9 million inhabitants living in areas close to the wall and / or settlements, accounts 400 thousand inhabitants. With respect to demolishment acts of the Israeli occupation forces in Palestine, 433 buildings (houses and establishments) have been destroyed in 2017, 46% of them in Al-Quds. Demolished buildings include 170 houses (148 of them in Al-Quds), and 263 establishments including primary schools, forcibly displacing 180 families (818 persons) only in East Al-Quds, half of them are children. They also threatened to destroy 1,030 buildings in 2017, at a time when the needs of housing units for Palestinians increase. In figures, about 61% of households in Palestine need to build new housing units over the next decade according to the data of housing conditions survey 2015 (one residential unit or more). The demolition of the buildings resulted in large economic losses with a value of about 300 US dollars per square meters, meaning that the losses of Palestinians in Al-Quds amounted to about 51 million US dollars during the years 2000-2017.